We look forward to additional projects as well in the near future. This month’s OBW Beach Cleanup is set for Saturday, Oct. 15 at 3:00 p.m. at Birch State Park. As always, entry to the park is free for our volunteers, and service hours are available. This month, in light of Hurricane Matthew’s impact on Haiti, OBW will be collecting donations for hurricane relief. We will be accepting donations of goods and cash. There will be a limited number of “I am Hope for Haiti” bracelets to be given to those who bring donations. For the first time ever, One Beautiful World has a Relay for Life team in Weston’s Relay. This is an annual event that takes places all across the country to raise money for the American Cancer Society. The OBW Youth Board has planned many different fundraising activities for the event. Come down to Cypress Bay High School on Saturday, April 9, to support our youth and to participate in this great event. The kids will be there all night long! GeoLearning teaches the fundamentals of geography incorporating live music, rhythm, and movement. This is a free, twice monthly summer program for ages 3 to 6, led by the wonderful Miss Linda Sindt. The GeoLearning classes will be will be held at 11:00 a.m. on the following Saturdays: June 13 and 27, July 18 and 25. Join us at the Davie/Cooper City, located along Griffin Road, between Pine Island and University. The address is 4600 SW 82 Avenue, Davie, FL 33328. Each GeoLearning class will be similar, but it is recommended that children attend the entire series, since the repetition of the material will aid in the retention of the information. By the end of the series, the children should know songs that list all of the continents and oceans. Graduates of this program remember the songs years later. Free Guitar Lessons this Summer! We are so pleased to be able to bring free guitar lessons to our community this summer. Kids ages 9-14 are invited to join us on Tuesdays, from 12:30 to 1:15, at the Davie/Cooper City Library, located on the south side of Griffin Road, between Pine Island and University. The address is 4600 SW 82 Avenue, Davie, FL 33328. back links check . The lessons run from June 10 through the end of July. whois domain name Participants must bring their on guitars. Class size is limited, so please only register if your child can be present at all or most of the classes. Cal the Youth Services Desk at 954-357-6399 to register. This year’s Earth Day Beach Cleanup will take place on Saturday, April 20, at 9:00 a.m. at John U. Lloyd Beach State Park. Normally, our cleanups take place in the afternoons at Hugh Taylor Birch State Park. Due to the Lauderdale Air Show, however, the Earth Day cleanup will be moving south to Dania Beach. John U. Lloyd Beach State Park is located at 6503 N. Ocean Drive, Dania Beach, Florida 33004. Volunteers should meet at parking lot #2 in the Southeast corner of the park. Our Earth Day cleanup will be a special event, with goodies for the first 50 children to arrive. As always, we will provide all cleanup supplies, from gloves and bags to hand sanitizer. We ask that the participants wear sunscreen and closed-toe shoes, and bring water. Entry to the park is free when you tell the personnel that you are there for the One Beautiful World Beach Cleanup. 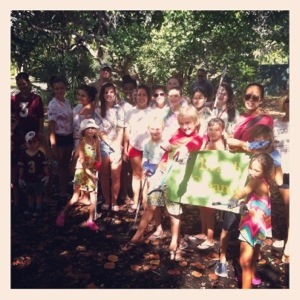 Thanks to everyone for helping clean up the beach around Hugh Taylor Birch State Park. It was a hot day, but we definitely made a difference. See you next month! Local educator and musician, Miss Linda Sindt, has written an uplifting song for children about 9/11. She has made a video of the song, and given it to One Beautiful World for our You Tube channel. See miss Linda perform it live on Saturday, Sept. 8, at 1:00 p.m., at the Davie/Cooper City Library! OBW is starting a new book club! Thanks to another grant from Target, One Beautiful World is starting a new monthly book club on November 12, 2012. Called “Read Around the World,” this geography-based book club will introduce children to different countries around the world through books, music, and artifacts. The first session of the book club, led by educator Linda Sindt, will take place on November 12, 2012. The first country studied will be the United States, followed by Canada and Mexico. This book club is for children grades 2-5. There will be books for various reading levels available for each country. If your children enjoyed Miss Linda’s geography classes, they’ll love this! One Beautiful World just received its third consecutive Target Early Literacy Grant for our book clubs! Thank you Target!